Pet owners frequently ask questions when their dogs get ill shortly after being vaccinated. As a general rule, their vet will tell them that it’s just a coincidence. Canine Health Concern sought to establish whether there was a correlation between vaccination and subsequent illness, based upon the observations of homeopathic vet Christopher Day in practice. 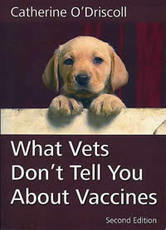 These are our findings, first published in What Vets Don’t Tell You About Vaccines. * Please note that this survey is finished; we are not looking to extend it. The British government expressed extreme interest in this survey’s results, and the Veterinary Medicines Directorate asked to examine our base data. We were willing, provided they appoint an expert skilled in statistical analysis who had no ties to the veterinary vaccine industry. They put up an academic who was consultant to Intervet, a veterinary vaccine manufacturer. The veterinary vaccine industry responded by paying a vaccine developer, the Animal Health Trust, to conduct the POOCH survey. This survey asked a totally different question, looking through client records held by amenable vets. Not surprisingly, this industry-funded research found no correlation between vaccination and subsequent illness. You have to ask why the VMD would champion industry data over independent data. The Canine Health Concern vaccine survey was first launched during October 1996. A questionnaire was devised with the help of Christopher Day, Jean Dodds DVM, and Dr Viera Scheibner. Some 30,000 readers of Dog World magazine were invited to participate: we paid an advertising rate to have the questionnaire printed within the publication. In addition, all members of Canine Health Concern were mailed with a questionnaire, and some members of CHC (very kindly) circulated the questionnaire to friends and neighbours. The first edition of What Vets Don’t Tell You About Vaccines carried our first interim findings. The second edition added over a thousand dogs to the picture. The total number of dogs surveyed was 3,800. We were been able to show a definite statistical correlation between a vaccinate event and the onset of a number of specific illnesses. The following published provisional conclusions all satisfied mathematical or inferential statistical tests at a level of confidence of 99% or better. That is, we have rejected, unless otherwise stated, any result with a z alpha of less than 2.56. In mathematical terms, an alpha score of 4 would mean that the chance of a false conclusion is less than one in about 33,000. In many cases, the data we have is greatly in excess of 4, making the following conclusions a certainty for all practical purposes. The hypothesis is that, if vaccination has no adverse effect or even bearing on subsequent illness, then illnesses will occur in equal numbers at any time during the twelve months after vaccination. In fact, the results so far gathered show a distinct skew or bias towards illness occurring within the first three months after vaccination. No data was recorded in respect of lupus, Lyme disease or rabies in the first analysis, but one dog with lupus was incorporated into the second analysis. Obviously, no statistical conclusions can be drawn on such a sample size. Some diseases showed a distinct bias towards occurring at nine months or more after vaccination had taken place. These are arthritis and heart conditions. We do, though, ask why these illnesses should all be clustered together at around the nine month period? It may, in fact, suggest that it takes longer for these illnesses to manifest overt symptoms, and consequently for diagnosis to take place. If vaccination had no bearing, then there should by rights be an even spread of occurrence throughout the twelve month period. Although samples are small in terms of the number of dogs in each breed, it is clear that some breeds have a distinct propensity to heart conditions and additional data would permit us to assess whether or not such heart conditions were affected by vaccination. These breeds are Beagles, Bernese Mountain Dogs, Cavalier King Charles Spaniels, Irish Wolfhounds, and Miniature Poodles. The first, astounding, finding of our initial survey results showed that, overall, 55% of all illnesses reported by participants occurred within the first three months of vaccination. This has risen to 66% in the second analysis. If the vaccine had no bearing on the illness, you would expect to see no more than 25% occurring within that three month time frame. The New England Journal of Medicine (vol. 313 no 18, 1985), carried a research report entitled ‘Persistent rubella virus infection associated with chronic arthritis in children’. The report confirms that infection or immunisation with rubella virus has been recognised in producing an acute synovitis (inflammation of the joint) . . . which has been reported to recur in certain persons for months or years after the acute stage’. It is also reported that it is often possible to isolate the virus from affected joints in children, vaccinated against rubella, many months after the vaccination. Arthritis can be either inflammatory or non-inflammatory. Stratton Vaccines: 97 carries case reports linking tetanus and diphtheria vaccines with arthritis and skin eruptions. The US National Academy of Sciences IOM report concluded that the measles vaccine can cause death from measles-vaccine-strain infection, thrombocytopenia, fatal shock and arthritis. Measles and distemper are, as you know, virtually the same virus. Transient arthritis follows rubella vaccination (Am J Child Dis, 1969), and pain in wrists, hands and knees (JAMA, 1970). One study reported that as many as 26% of children receiving rubella vaccination develop arthritis (Science, 1977). A study by the Institutes of Medicine in America concluded that there was evidence of a causal relationship between the rubella vaccine and acute arthritis in 13-15% of adult women. Where dogs had diarrhoea, 68% of cases occurred within the first three months following vaccination. 4.9% of dogs surveyed had diarrhoea at some stage. This could be a mild anaphylactic reaction. Anaphylactic reactions can be an indication that encephalitis might follow. You will already have seen how encephalitis (inflammation of the brain) has been shown to follow vaccination, even where no overt reaction has occurred. Incidentally, anaphylaxis and anaphylactic shock are not the same thing. Anaphylaxis is a Type 1 hypersensitivity reaction which involves the release of histamine. Anaphylactic shock is an extreme allergic reaction that could result in death. At 99% confidence interval, diarrhoea is highly likely to be vaccine related. The data satisfies the one-tail test but not the two-tail test. 54.8% of dogs in the survey developed this condition within the first three months after vaccination. However, there were abnormally low incidences occurring at the six month and nine month intervals, which may be explained by delays in diagnosis. We can now say that AI related diseases, at a 95% confidence interval, are vaccine-related. Where owners reported a loss of appetite in their dogs, 79.8% were within 3 months after vaccination. 3.4% of dogs surveyed suffered a loss of appetite at some stage. Loss of appetite is vaccine related at 95% confidence. Where dogs exhibited a nervous or worrying disposition, 54.8% began to do so within three months post-vaccination. 2.8% of dogs surveyed suffered from this complaint. This is THE certainty of the survey! It has the highest t-score of any group, i.e., 19.9. Combined with another category – behavioural problems – we can say without a shadow of a doubt that vaccines cause total personality changes in dogs. Of course, we know that encephalitis can be caused by vaccines. This fact is irrefutable. With the exception of distemper and leptospirosis, where not enough dogs with the disease were recorded, all of the above satisfy a z alpha score of more than three. This means that we are 99.53% certain that there is a strong causal link between vaccination and the onset of the diseases. MLV vaccines are capable of spreading disease. Looking at the reactions/illnesses reported after vaccination in the survey, we have a probability of .7990868. In view of some of the above statistics, it is not unreasonable to conclude that the probability of a vaccine-related disease occurring is in the order of 1% (i.e., one in a hundred). Only a small number of dogs in the survey had never been vaccinated. We need more data about unvaccinated dogs, including dogs protected exclusively with homoeopathic nosodes, before conclusions can be drawn. So if you have an unvaccinated dog, please contact us for a questionnaire. It will take you only ten minutes to complete. Based on combined survey data, we checked to see if it might be better to give annual boosters, or to give a puppy its initial course of vaccines and none thereafter. The risk of vaccine reaction appears to be the same irrespective of regime – initial only or annual vaccination. Nor do killed vaccines appear to be any safer than modified live vaccines. Based on the data gained after publication of the first edition of this book, we compared the profile of the second batch of data with the first. The objective was to ascertain whether or not we had received any different data that would invalidate previous conclusions. The second batch of data was a very close match to the first batch and statistically it can be concluded that the first and second batches of data are identical as to content. Encephalitis occurring within three months of vaccination has risen from 75% to 78.6%. The Chi score for this is 22. It’s interesting that this is a known and acknowledged vaccine reaction, and our survey shows well above a 99% certainty that it’s vaccine related – but some other diseases which are not acknowledge as vaccine reactions show even higher Chi scores. Diarrhoea – first interim results showed that 68% of the dogs in the survey with diarrhoea developed it within three months of vaccination. This has now risen to 78.4%. The Chi score is 290. Thus it is absolutely certain (not surprisingly) that vaccines can induce diarrhoea. Not too much of a problem if underlying encephalitis isn’t involved. Lameness – was 52%, now 66.7% with a Chi score 66. A vet was reported in the UK media during 1998, saying that we shouldn’t allow our dogs upstairs as this is the cause of lameness!